Earlier this month, Alabama — the first state to adopt an all-ACT college readiness testing format — released some of the data collected from last spring’s standardized testing, and the results are helping educators get a better idea of how students in the state are learning. 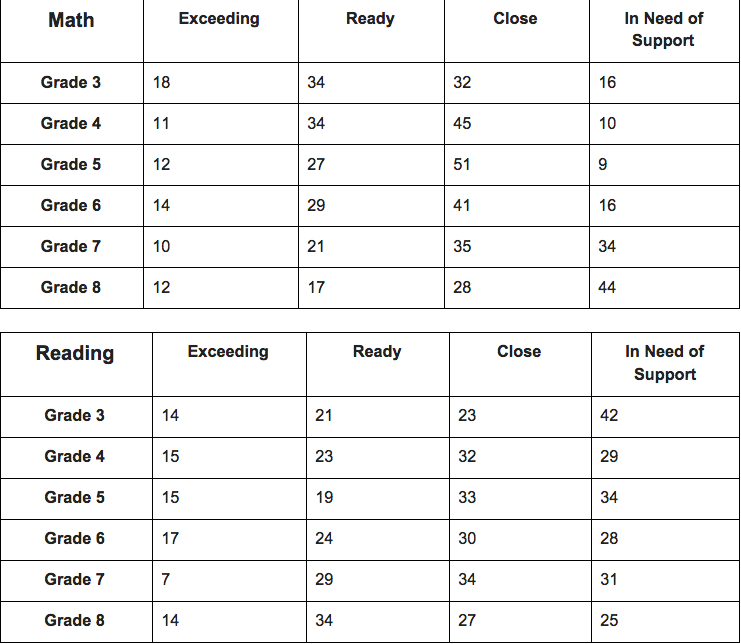 The scores are categorized in terms of “exceeding,” “ready,” “close” and “in need of support” for students in grades 3-8 for reading and mathematics. Statewide percentages showed a need for improvement, with less than 50 percent of students in their respective grades scoring “ready” for entry-level college courses related to the tested subject areas of reading and math. This breakdown from the Alabama State Department of Education shows the percentages of students meeting, not meeting or exceeding the new standards in English and mathematics. In 2013, the Alabama State Board of Education began working with ACT to establish benchmark measures for the state’s new college and career-ready standards — standards mostly comprised of the controversial Common Core State Standards adopted by 46 states and the District of Columbia. 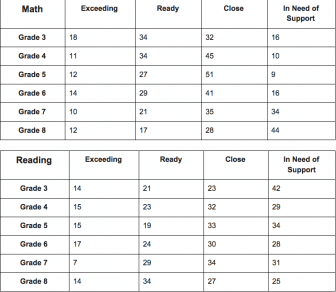 Last spring, students in grades 3 through 8 took the first year of new assessments aligned to Common Core, the ACT Aspire, in place of the Alabama Reading and Math Test (ARMT). The press release from the Alabama State Department of Education said the state “had a real need to move to higher-level tests,” prompting the unilateral move to ACT. The change in elementary and junior high testing came the same year Alabama’s juniors took the ACT, a college entrance exam, for the first time. According to the ALSDE, the ACT Aspire focuses less on multiple-choice questions and more on open-response questions, and “meaningful, honest feedback” to ensure students are on track. According to the state, only one in five Alabama high school graduates was ready for college based on the ACT College Readiness Benchmarks in 2013, and one in three college students required remedial classes in math, English or both. The ACT Aspire represents a significant change from how student achievement has been defined and will change how student and school performance is reported in the future. Student ability is not suddenly dropping with the shift to the new tests. Instead, the expectation of what students must know and be able to do on state assessments has become more rigorous. Bice said that was because the academic expectations of Alabama’s students have been too low in the past. In conjunction with the release of statewide data, Mobile and Baldwin county public schools followed suit days later by disclosing their respective district’s scores. However, MCPSS officials chose only to release numbers for the “ready” and “close” categories, which revealed students scored lower in the reading and math averages, but excelled in English by scoring higher than the benchmark. While Mobile County students’ scores in reading and math were lower than the new averages set by ACT, the scores were comparable to the national average when ranked with other schools. “While we recognize that there is room for improvement, we did exceed the state percentages for students meeting or exceeding the ACT benchmark in every grade level in both subjects,” Baldwin County schools spokesman Terry Wilhite said. A total of 334,573 students across the state took the ACT Aspire assessment. The tests are administered in late spring during the closing weeks of the school year to ensure student learning continues as long as possible. In May, the Mobile County Public School System was the first district to give the test entirely online. In an interview with Lagniappe at the time, MCPSS Supervisor of Marketing and Partnerships Rena Philips said the flexible online schedule allows classes to take the test when it’s convenient for teachers and their lesson plans. The online format will also significantly reduce the time it takes teachers to return the results from testing. Next year, school districts expect to receive results within 40 days after the testing window ends.